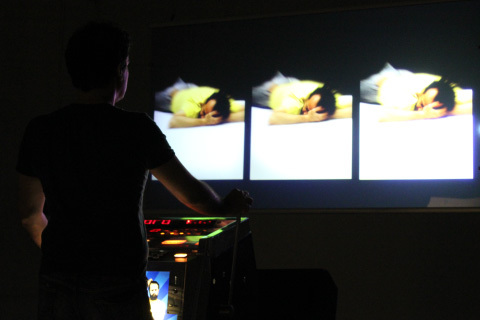 MindBox is producted by Humatic Berlin in collaboration with TMA Hellerau (Dresda) and Compagnia Zappalà Danza. The technology of MindBox is based on HUMA system and FTM & Co libraries for Max/MSP. 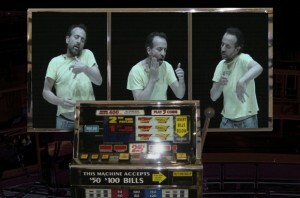 Christian Graupner & Partners have created a triptych video capable of interacting with the public and is based on the model of the slot machines. With the audio-visual triptych MindBox Christian Graupner & partners created an audience reactive installation and an electro acoustic music instrument using the body of a ‘one armed bandit’ as an user interface. MindBox is a part of the work cycle H.RP [Humatic Re-Performing] . MindBox is a triple-channel ‘media catapult’ to be touched.The arm and buttons of the modified fruit machine function as a tactile interface to the actions of a filmed character whose vocal- & movement clusters can be re-composed and re-performed by the audience. Christian Graupner is a Berlin based artist, film composer, guest artist at ZKM Karlsruhe and the creator and developer of real-time media playback systems. His wide ranging earlier works were made up of drawings, paintings and experimental electronic music, mostly published on records, CDs as well as in movies and radio plays under the pseudonym VOOV. 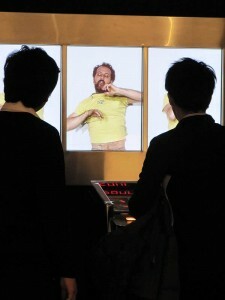 Lately he has developed a series of reactive media installations in which characters appear significantly in the foreground. With his works such as ‘2Lives Left’ and newest projects ‘MindBox’ and ‘Don’t Dance’, he is keeping alive his conceptual platform ‘Automatic Clubbing’. In 2000 he formed the independent artist group and production company Humatic Ltd. together with Nils Peters with whom he develops software tools for artists working in a variety of media forms. focusing on real-time interaction. Besides his engagement in artistic productions with composers such as Boulez, Manoury, Nunes and Stroppa, his team participates in a diversity of international research projects. In June 2006 he organized and chaired the 6th International Conference on New Interfaces for Musical Expression at IRCAM.